4 Must-See Pins from Pinterest: Summer Hair Styles and Fun Colors! We saw this when scrolling through Pinterest one day and thought “WOW that is some seriously awesome hair!” What screams out SUMMER like hair that looks like the ocean? The different shades of blue and light green really blend well together and come together to look unique when styled in different fashions. The only downside to this hairstyle is that your typical office manager might not be ecstatic about such an out-there color, but for those who can do it and pull it off–go for it! Ombre has been all the rage in the last year or so, but it’s generally a brunette to blonde transformation. Mix it up with red at the root. 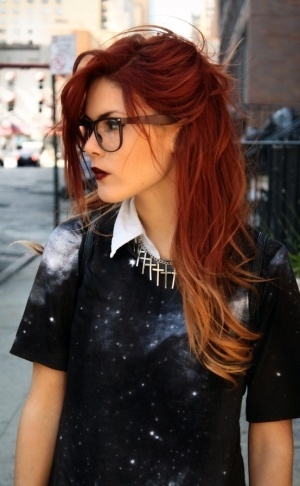 Red hair is something that gives you a little extra “umph,” while still staying classy in within the means of regular hair colors. This is a project you could do yourself with the assistant of YouTube or other internet tutorials of dip-dying, or ask your hairstylist if they would be comfortable helping you out with this project! The Sock Bun is one of the great go-to summer hair styles on lazy hair days, but add a little bit of a twist to the style with a french braid. Whether it’s from the bottom of your head to the bun or from your bangs and back, a braid can spice up this quick and simple look. Simply braid your hair in the fashion you desire then place your hair in a ponytail. Then simply take an old sock, cut off the toe, and roll it into a “donut.” Place the sock around the tips of the ponytail and roll down, tucking in strands of hair as you go. Spray with hairspray and you’re good to go! For more tips, styles, colors and more summer hair styles, follow us on Pinterest and keep up with our favorite hair trends!